It is no secret that the Catholic belief in the inerrancy of scripture has been under assault for several hundred years, and never more alarmingly-so than during the early and mid-twentieth century. This undermining of the absolute truth of holy scripture began with the protestant rebellion, and this process was intensified by the rationalist movement of the enlightenment in Europe in the 18th and 19th centuries. 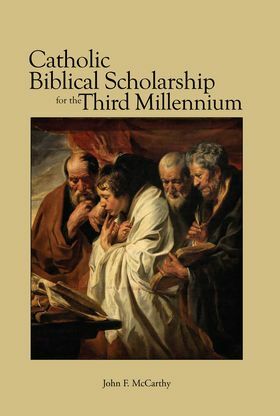 Unfortunately, this trend has affected many Catholic biblical scholars so deeply that the state of affairs across a wide spectrum of Catholic philosophers, theologians, and biblical commentators displays an atmosphere of confusion and lack of clarity required for these servants of the Church to move forward confidently with their work. Msgr. McCarthy has been involved with the Oblates of Wisdom and the Roman Theological Forum since their founding, and he has published many articles in the journal Living Tradition in defense of a truly Catholic approach to biblical scholarship, which he calls the neo-patristic method. Helping to restore confidence and holy clarity to the field of biblical science has been his lifetime commitment. This book is his prescription for an ailing field of study. &copy 2004-2016 Loreto Publications Inc, all rights reserved..